The Butcher, The Baker, The Cappuccino Maker takes it name from the famous nursery rhyme (the Butcher, The Baker, and the Candlestick Maker in the nursery rhyme Rub-a-dub-dub). They cleverly substitute candlestick maker with cappuccino maker and it works quite well for their concept. They opened a few weeks ago and I recently paid them a visit. BBCM is located in the iconic Sunset West Plaza. This is a popular destination visited by the locals due to the chic shops and outdoor cafes. People in the know take advantage of the free parking available behind each business. The intent behind The Butcher, The Baker, The Cappuccino Maker is one of community. Breakfast was central to their strategy and so they created a bakery as the foundation. Not wanting to be breakfast-only, they designed their menu to incorporate their seasonal farm to table cuisine for lunch and dinner. The appearance is one of a classy European cafe. The use of marble is extensive; the counter top for the bar is a large block of marble and even the plates are made of marble. The outside is landscaped with beautiful 100 year-old olive trees and there are quite a few tables available for al fresco dining. 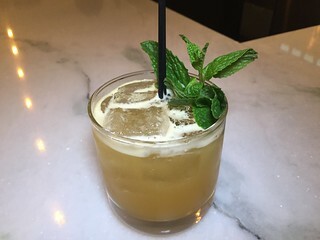 The kitchen is led by the duo of Executive Chefs Ren Nisenbaum (formerly of Jaleo, Washington, D.C. and Morimoto and Jean Georges in NYC) and Craig Hopson (formerly of Le Cirque, Picholine and Beautique in NYC) and features seasonal local farm-fresh ingredients. 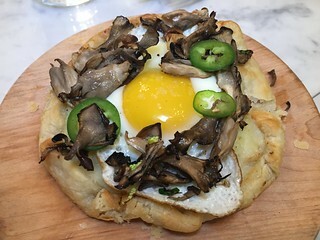 Consistent with their European bakery foundation, they use the French galette for some of their dishes. 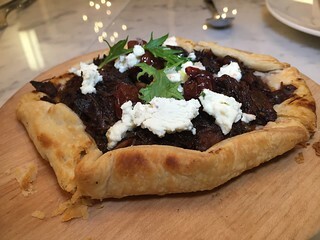 I tried two of their galetes: the Beef Short Rib with cherries, arugula and boursin was tasty. The use of cherries blended extremely well with the beef short ribs. I especially enjoyed the Galette of Bacalhau. The flavors of mushrooms, jalapeños and a sunny side up egg worked extremely well with the salted dried cod. 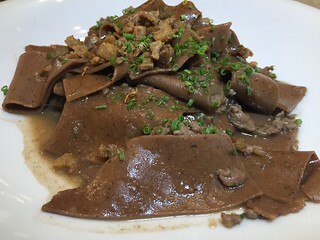 Chestnut Pappardelle - The rich taste of duck and mushrooms permeated the pasta noodles and transformed the pasta to a nice savory taste. 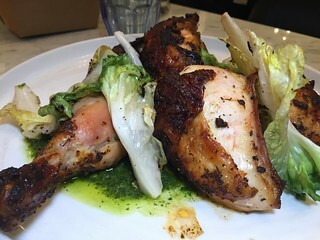 Roast Free Range Chicken with salsa verde and escarole. The seasoning applied to the outside of the chicken was complex and delicious. The added bonus was that the chicken was both crisp on the outside and juicy on the inside. 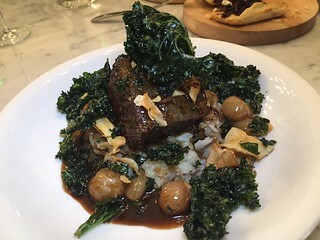 The Beef Short Rib was combined with crushed sunchokes. They were tender and did not require a knife for slicing and blended well with the nutty taste of the sunchokes. Kale chips provided a crunchy texture to the entree. 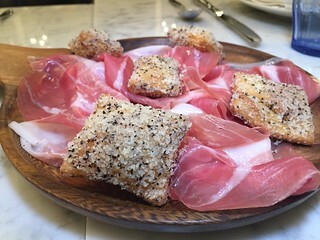 Pillow fried cheese filled with prosciutto and applied with salt and coarse pepper. Beverages included a glass of Pinot Gris from the King Estate Signature Collection, the With Passion and the Sandia Mia. The Pinot Gris is well balanced and due to its acidity can pair nicely with a number of items. 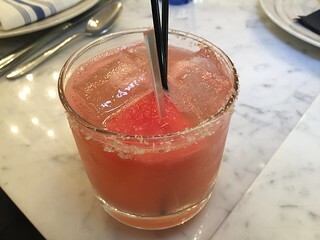 Of the two craft cocktails, the Sandia Mia edged out the With Passion. Sandia Mia was fruit forward made with Casamigos tequila blanco, fresh lime, agave, watermelon, grapefruit and sugar. 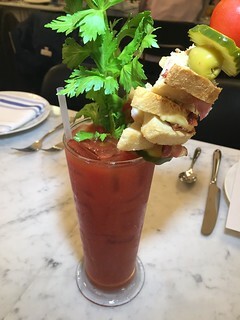 The Butcher’s Bloody Mary is a sight to behold! Their craft beer includes selections from Ballast Point (Long Beach) Absolution Brewery (Torrance) and Lagunitas (Marin County). The wine list appears to be purposely diverse. While not extensive, they manage to feature non domestic wines from Italy, France, New Zealand, Argentina and Australia. Their US selections extend beyond Napa and Sonoma counties. Many wines are available by the glass. Inside the restaurant is an impressive Gisen Coffee Roaster. The burlap bags on the floor a few feet away, I thought, were part of the interior decor, but they are actually filled with coffee beans from locations like Colombia, Guatemala and Indonesia. They roasted coffee beans while I was there so that I could see the roaster in operation. 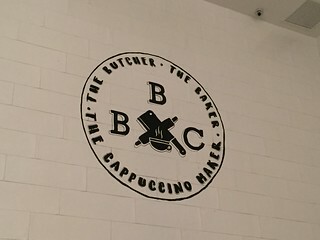 The Butcher, The Baker, The Cappuccino Maker is an excellent place for the West Hollywood locals. 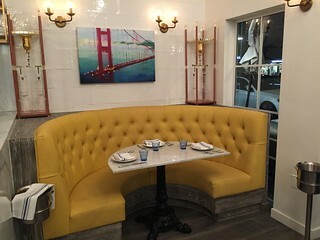 I also think that it can serve well as a dinner destination prior to attending an event at the Dolby Theater or the plethora of popular Hollywood destinations.